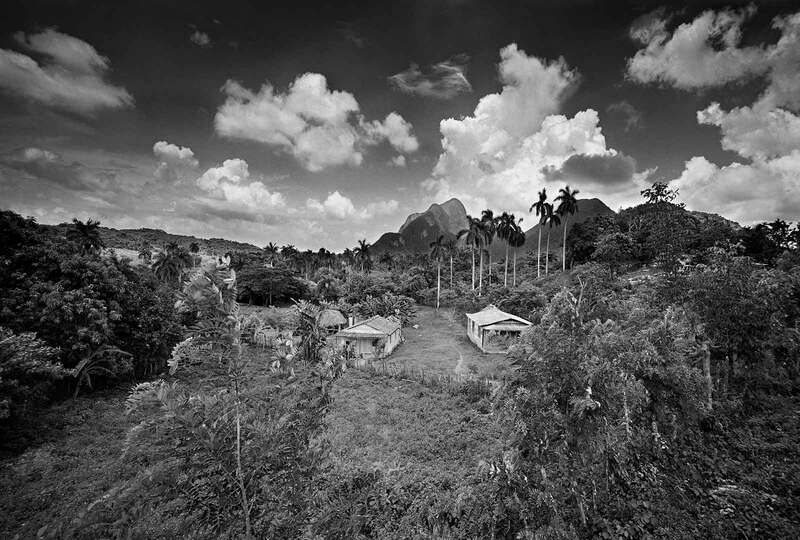 Photographic Story The Department of Flora and Fauna joined me on my expedition of the western mountains of Cuba. They did a great job educating me about the environment of the area. We were in places where there were no towns so when we got hungry we would walk out into the forest and return with fresh fruits to eat. Periodically, we’d come across a community farm, such as the one in the foreground of this photograph. It is a typical farm community that can be seen throughout Cuba. We would also come across gas stations that were similar to our convenience stores, only not as well stocked. The mogotes of Cuba are located in the south west of the island. They are beautifully mysterious large mounds composed of limestone, marble or dolomite and are surrounded by nearly flat alluvial plains. I could have stayed and photographed this area for a much longer time than the two days I had available. In order to get this photograph I had to raise the tripod nine feet so I could shoot over the bushes in the foreground. I really had no idea what how the photograph would turn out. Digital – Archival Pigment Print This photograph was taken with an analog large format camera. After Clyde develops the negative, the film is scanned and edited in a computer program mimicking his darkroom techniques. The photograph is printed on an Epson Stylus 4800 or 11880 printer. Clyde uses archival Ultra-chrome K3 ink and prints on archival Harman Hahnemuhle paper. The limited edition photograph is then mounted and matted to current archival standards. This is a limited edition series and each photograph is numbered.